This is a beautifully presented, informative and interesting book that will engage children of all ages in considering the origins of things we take for granted. This encyclopedia covers everything from early tools and the beginnings of industry through to transport, communications, medical advances and space technology. It is a unique approach to an encyclopedia, summarising individual inventions with a simple What? Who? Where and When? format and an accompanying image, whilst subtly building a picture of the development of modern society. Beginning with early breakthroughs, we are introduced to inventions for farming, sea travel and navigation through to waterwheels and windmills. Inventors such as Archimedes, Leonardo da Vinci and Zhang Heng are profiled with timelines and key inventions. Did you know that Alfred Nobel of Peace Prize fame was actually the inventor of dynamite? It is amazing to consider how the developments made hundreds and even thousands of years ago have shaped the world we live in today. Consider how the invention of the printing press changed society, enabling the rapid production and distribution of books. Or what about the invention of guns? Moving to more modern times, we explore the impact of tools and construction technology, including lifts and escalators. Also, the invention of various forms of power, including renewable energies. Where would the world be without plastics, credit cards and materials? What about different types of transportation on land, sea and air? Phones, photos and TV? Of course, this book also delves into modern technologies. Computers, the internet, kitchen and household appliances and video games, all of which today’s children take for granted. Medical advances are also covered, including the invention of vaccines, treatments and prosthetic limbs. This is a substantial kids’ encyclopedia with a wealth of information. 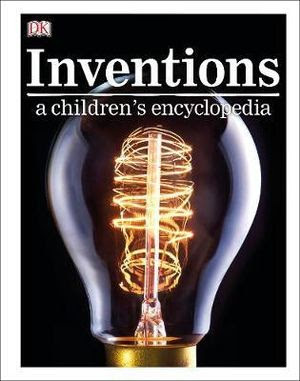 Children as young as eight will find snippets of interesting facts to read, whilst teenagers and even adults will piece individual inventions together to gain a greater understanding of our world. An amazing book, well worth the investment for both school and home libraries.